HAVANA (AP) — The wife of Alan Gross, a U.S. government development subcontractor serving a 15-year prison sentence in Cuba, said Wednesday she fears for his life even more after he received the demoralizing news of his mother’s death from cancer. 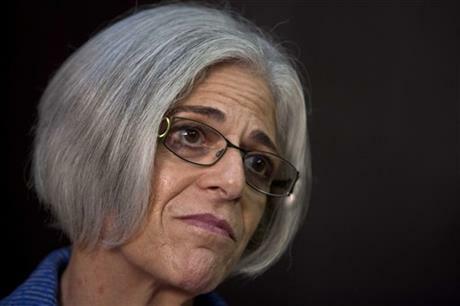 Speaking in Havana a day after visiting her husband behind bars, Judy Gross said he was very close to his mother, talking to her by phone twice a day when he was in the United States and as often as he could after his incarceration in Cuba. U.S. and Cuban officials did not have immediate comment. U.S. diplomats in Havana make monthly consular visits to the facility where Gross is being held, but generally refrain from speaking about his case, citing privacy rules. Gross was arrested in 2009 while working to set up Internet networks for the island’s Jewish community on a contract with the U.S. government’s Agency for International Development. Washington argues that his activities were humanitarian, and he says he posed no threat to Cuba. However, some aspects of his work violated Cuban law, and Gross’ documents show he tried to avoid detection. Havana considers such USAID programs an affront to its sovereignty, and Gross was convicted under a statute governing crimes against the state. Gross staged a hunger strike in April to protest his confinement and pressure Washington and Havana to resolve his case. He ended it after nine days at the request of his mother, Evelyn Gross, who died June 18 in Texas at age 92. Gross had asked for leave to visit her, but was denied. His wife said he emailed her a short eulogy that was read at the funeral, which she was unable to attend because her own brother died the same week. Gross has lost more than 100 pounds, is losing vision in his right eye and “both of his hips are failing,” according to a statement issued Wednesday by the family’s representatives. Judy Gross said he seemed markedly worse than on any of her five previous trips to the island. Scott Gilbert, the Grosses’ U.S. lawyer, accompanied her to Cuba and also met with his client. Havana has made clear it wants to negotiate a solution involving Cuban intelligence agents who are serving long prison sentences in the United States on spy-related charges. Two of the “Cuban Five” agents have already completed their sentences and returned to the island. Judy Gross stopped short of calling for a swap outright, but noted the recent exchange of five detainees at Guantanamo for Bowe Bergdahl, a U.S. soldier held captive in Afghanistan. She said she viewed recent reports that President Barack Obama asked the president of Uruguay to get involved in her husband’s case as positive. But she said more must be done, and both sides must sit down to figure out a solution. “I’m calling for whatever it takes,” she said. She said her husband’s imprisonment has taken a great toll on the family. But “I can’t allow myself to really get down or to not do anything — otherwise he won’t come home. … I have to stay strong,” she said.